Griffithites, Still Crippled, Go on Field Behind Pitcher Al Orth. Little Shortstop Takes Chance with His Charley Horse in Getting in Action. 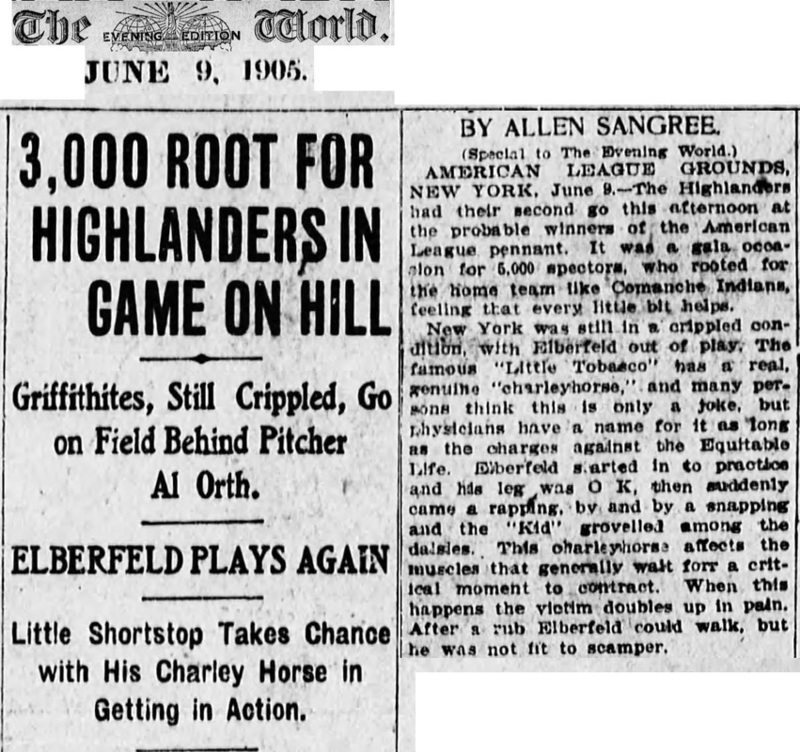 AMERICAN LEAGUE GROUNDS, NEW YORK, June 9.-The Highlanders had their second go this afternoon at the probable winners of the American League pennant. It was a gala ocassion for 5.000 spectators, who rooted for the home team like Comanche Indians, feeling that every little bit helps. New York was still in a crippled condition with Elberfeld out of play. The famous "Little Tobasco" has a real, genuine "charley horse," and many persons think this is only a joke, but physicians have a name for it as long as the charges against the Equitable Life. Elberfeld started in to practice and his leg was OK, then suddenly came a rapping, by and by a snapping and the "Kid" grovelled among the daisies. This charley horse affects the muscles that generally wait for a critical moment to contract. When this happens the victim doubles up in pain. After a rub Elberfeld could walk, but he was not fit to scamper.